Locally known as "JK," Julius Kahn is adjacent to the Presidio, the nation's largest urban National Park. The playground is in excellent condition and provides kids and parents two structures to choose from--one designed for babies and toddlers, and another for school-aged kids. Both playgrounds are situated in a sand pit! 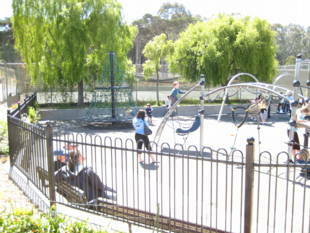 JK also has basketball and tennis courts, and soccer and baseball fields that makes this park appealing to people of all ages. This park is very green and is surrounded by a grove of beautiful trees that make this spot a great place to hike and explore. The clubhouse has water fountains and restrooms available to the public. 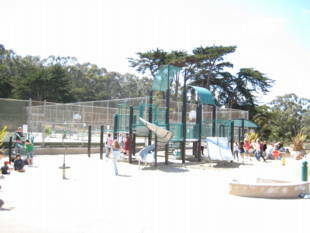 Julius Kahn Playground is owned by the San Francisco Recreation and Park Department. 3-Jackson -- Presidio and Jackson stop; walk one block to Pacific, then three blocks west (slight downhill) to the park. 43-Masonic -- Presidio and Jackson stop; walk one block to Pacific, then three blocks west (slight downhill) to the park. 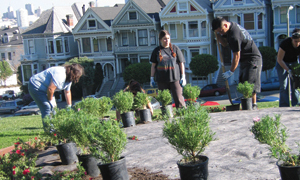 Call the SF Parks & Recreation Department to reserve the park for parties at 415.831.5500. 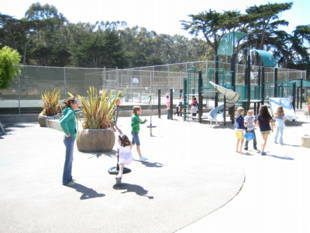 Operated by the City of San Francisco, Julius Kahn Park is tucked along the southern border of the Presidio. Serving the military community and families from neighboring districts since its establishment in 1923, this park provides newly revitalized playgrounds and ballfields to the general public.